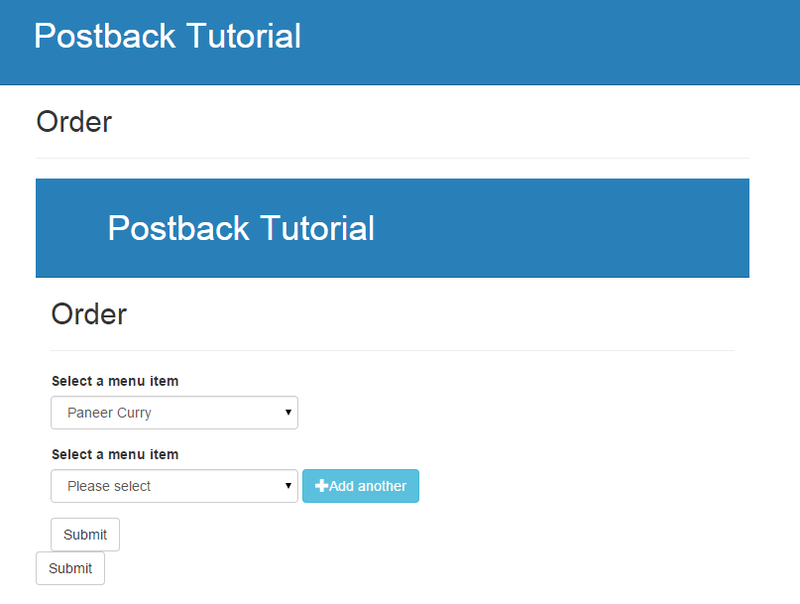 So far we have created a form which performs a postback to the server to add more input fields to the same page. We have encountered an issue with MVC seeming to cache partial views (or at least the values inside them). Step 4 attempts to fix the caching of the selected value field. I spent hours looking for a way to stop MVC caching partial views, which is what I thought was happening. I tried disabling the output cache and loading the partial views via actions, neither of which helped. I finally found this answer on StackOverflow; the ModelState holds the old values when a view is reloaded via an HTTP POST even if you change the values of the model in the action. By removing the specific value from the ModelState the value clears properly and the view displays as expected. Note that we pass event to the onclick attribute, this is required for the code to work on Firefox. The next argument to $.post() is the data to submit to the URL, this uses jQuery's Serialize to send the form data in the format required. The done function does not run immediately because it is a "promise", which means it executes asynchronously. When the Ajax request completes successfully the code in done will run, alternatively if there's an error then fail will run. The data passed to the function in done is the data returned by the request, in our case this is HTML, so we can just replace the content of the form with the returned data (using .html()) since the postback just returns the form with the extra input fields. Create the form and controller action with one submit button. Add another submit button with a name and a different value. You can use a parameter to the controller action with the name of the button to check the value of where the submit came from. Return the correct ActionResult for your desired action, watching out for caching in the ModelState. Add an Ajax request to the onclick of the submit button which calls the same controller action but returns partial views instead.